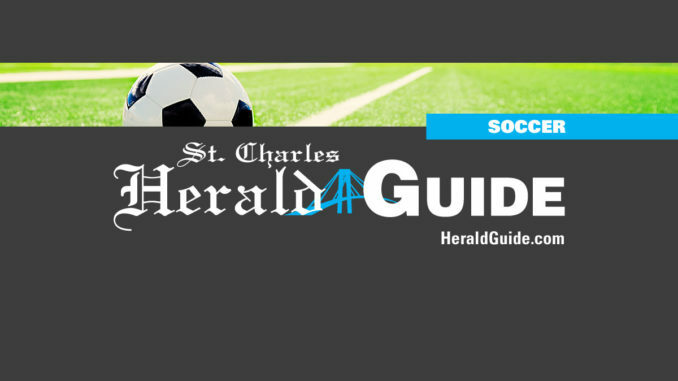 The Hahnville boys soccer team opened up district play with wins over Thibodaux and Destrehan. The Tigers cruised past Thibodaux with a 3-1 victory and held on late for a 1-0 shutout win over Destrehan. During the first half against Thibodaux, both teams had several shots on goal, but outstanding play by both goal keepers kept the game scoreless. In the second half, both teams came out with a faster pace with the edge going to the Hahnville Tigers. Senior Brennen Samaha helped set up the first goal for Hahnville after taking possession of the ball at midfield and working it into scoring territory with a cross to Colby Orgeron. Orgeron knocked it in to give the Tigers a 1-0 lead.Minutes later, the Tigers struck again with a long clear play by senior Brooks Duhe to fellow senior Chase Ledet. Ledet crossed it to Kevin Falgout who grooved the ball into the back of the net for a 2-0 lead. The Tigers seemed to be rolling towards a solid district shutout until a foul set Thibodaux up with a penalty shot. Hahnville senior goal keeper Lance Dupont made a diving attempt, but the kick fell in to cut into the Hahnville lead, 2-1. However, Hahnville senior Thane Jurenka would end Thibodaux’s hopes of a comeback when he received a clear ball and turned it into a goal to give the Tigers a 3-1 lead. Hahnville would play the rest of the game with a stiff defense lead by senior Bailey Breaux to secure the win. Days later, the Tigers picked up a huge district win against rival Destrehan. This year’s schedule had these two teams facing off early in what could have district championship implications. This game is always a great one to watch because both teams have a number of players who went on to win the state championship with the St. Charles Vipers. From whistle to whistle, both teams played a very intense battle of possession with ball movement in the hopes that one would make a mistake. The Tigers were able to score off of a cleared ball from Breaux up to Orgeron. Orgeron then dribbled past the DHS defense to take a shot which was deflected to the side. Orgeron was able to get to the ball again and tapped it in to give Hahnville a 1-0 first half lead. In the second half, both teams had plenty of shots on goal with the heavier workload going to Hahnville goal keeper Dupont. Destrehan made him earn his stripes on this night. Big pressure games are no stranger to Dupont, as he was MVP for the Vipers in the state tournament this past spring. This experience, along with solid play by his defensive teammates, allowed the Tigers to hold on to the lead and seal the victory.